David Sedaris’ family has always been an anchor in his essays. Over several books, readers have gotten insight into the sibling alliances and interactions that come with a large family. In “Calypso,” his 10th book, the specter of mortality looms over his work, as his family shrinks in number. Sedaris notes how he’s a couple years shy of 62, the same age his mother died 27 years ago. The author also writes about the questions raised by the suicide of his youngest sister Tiffany in 2013. And, this being a Sedaris collection, there’s the story of how he once fed his benign tumor to a sea turtle. The reptile, too, had a tumor, but on its head and it was the “size of my niece’s fist,” Sedaris observed. 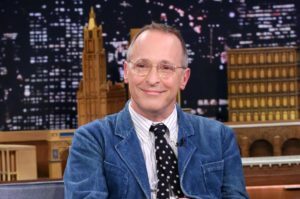 “I cannot remember the last time I laughed that hard at a book,” Sedaris said of Moshfegh’s story story collection, published last year. To be clear, the recommendation here is a humorist saying a funny book is extremely funny. Billed as a “pilgrimage of gratitude and generosity,” Bass’ new memoir is a gastronomical ode to some of his favorite writers, Sedaris among them. Bass traveled around the world and made meals for them. Bass “writes about nature like nobody else,” Sedaris said. As The New Yorker recounts, the tension was thick in the air — and music — in this “Bootleg Series” of 1960s live recordings from the jazz greats. “I just listen to it over and over and over again. It just reminds you how scandalous they were. you know, that music when it was introduced, it just blew the tops of people’s heads off,” Sedaris said.